On March 24, 2015 national chapters of Transparency International in Bulgaria, Romania, and Italy will conduct an event dedicated to the subject of the confiscation and forfeiture of criminal and illegal assets as a tool for fighting against serious crime. 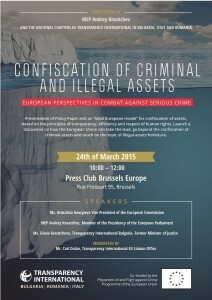 The event “Confiscation of Criminal and Illegal Assets: European Perspectives in Combat against Serious Crime” will be held in the Press Club Brussels Europe in Brussels, Belgium. The event will be hosted by MEP Andrey Kovatchev and co-organised by Transparency International – Bulgaria, Transparency International – Italy and Transparency International – Romania with the kind support of the EU Liaison Office of Transparency International in Brussels. The Vice-president of the European Commission for Budget and Human Resources, Ms. Kristalina Georgieva shall open the event. Members of the European Commission, Members of the European Parliament, experts and civil society organizations and media representatives are all invited to join the event. In the course of the event, an “ideal model” for confiscation and forfeiture of assets on national level will be presented. This model is bound on the principles of transparency, efficiency and respect for human rights. The model includes a number of standards and recommendations, which are meant to improve the confiscation of criminal and illegal assets procedures in EU Member States. We launch a discussion about the future increase of the common standards at EU level for confiscation of assets with illegal or criminal origin. Higher EU standards are a challenge but they are needed to ensure a smoother and faster cooperation among Member States’ National Asset Recovery Offices. They will contribute to easier recognition of judicial decisions, identification, freezing and management of assets. In addition, they will better support the Member States in their aim to prevent further investment of organized criminal groups’ financial resources in future criminal activities.